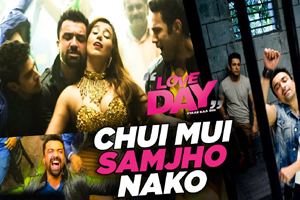 An item song sung by Bhoomi Trivedi featuring Ajaz Khan, Sahil Anand, Harsh Nagar. Star Cast: Ajaz Khan, Sahil Anand, Harsh Nagar, Ragini Nandwani, Sonal Singh, Deepti Sati, Rajit Kapoor, Makrand Deshpande. The audio of this song is available on YouTube at the official channel T-Series. This audio is of 3 minutes 38 seconds duration. Lyrics of "Chui Mui Samjho Nako"
Lyrics in Hindi (Unicode) of "छुई मुई समझो नको"